The Yaesu FT-ONE is an all-mode (CW, SSB, AM, FSK, and FM) solid state general coverage HF amateur radio (HAM) transceiver. The use of FM required an optional FM board be installed. The unit was designed for fixed, portable or mobile operation, although the size (380 mm x 157 mm x 350 mm) and weight (17 kg) would make it more suitable for fixed use. 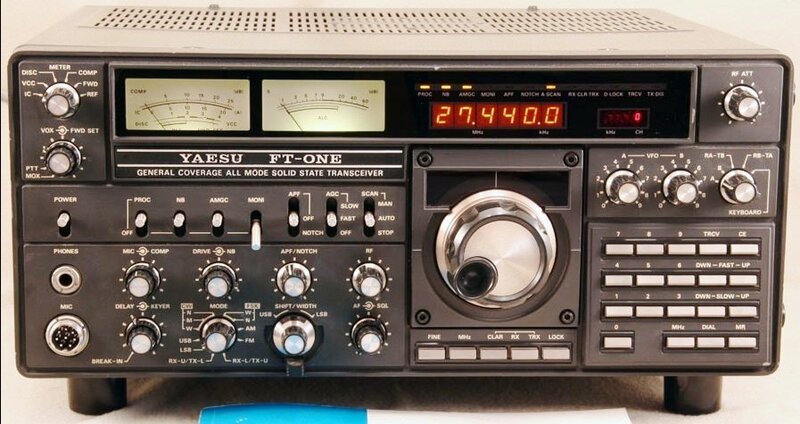 The FT-ONE was built by the Japanese Yaesu-Musen Corporation (usually called just Yaesu) from 1982 to 1986. At its release, the FT-ONE was launched as the successor to the FT-902 and as the new Yaesu top of the line transceiver. The FT-ONE was not only Yaesu’s first fully synthesized, computer controlled amateur band transceiver but it was also the first transceiver with a general coverage receiver. . The FT-ONE was sold on the U.S., Asian andEuropean markets. At $2800 at its 1982 release this was an expensive top of the line transceiver.